The largetooth sawfish, or common sawfish, can exceed 6 meters in length, although encountering an individual of this size is incredibly rare! Sawfish are easily distinguished by their long, saw-like rostra. While they are often mistaken for sharks they are actually rays. This species is known to live for up to 30 years, being able to reproduce between the age of 8 and 10 years. Litter size varies between 1 and 13 pups. Scientists believe they reproduce through yolk-sac viviparity, in which the embryos feed exclusively from the egg’s yolk inside the females, and the fully developed pup is born alive. 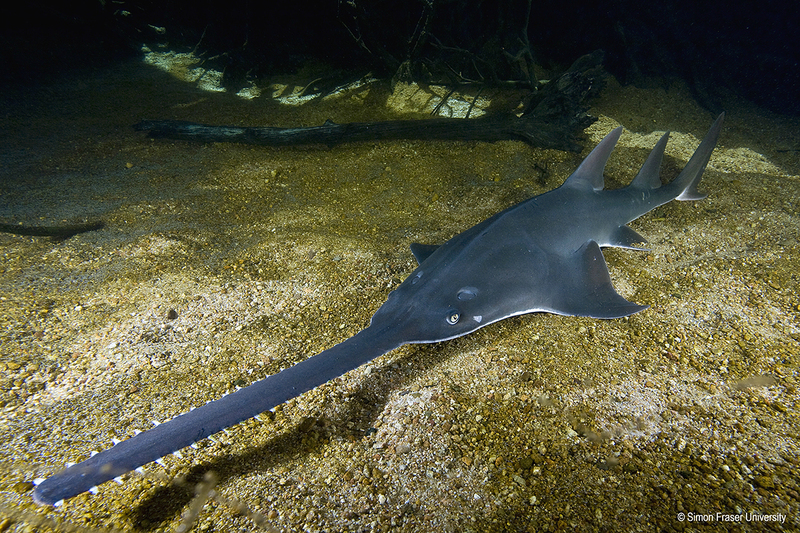 As with many chondrichthyans, the largetooth sawfish grows slowly, and life history data is scarce with the majority coming from studies in lake Nicaragua. Once common across its range, this species is now limited to four subpopulations within the tropics. As with many shark and ray species, they have been exploited for their fins, but mostly for their unique toothed rostra. At least five parts of the Largetooth Sawfish are traded. Along with the fins and rostra, the rostral teeth, meat, some organs, and the skin are sought after as curios, ceremonial weapons, and for traditional medicine in China, Mexico, and Brazil. Ancient Mayas were buried with sawfish teeth and cowboy boots were once made with sawfish skin. Bycatch in the fishing industry and habitat modification and pollution are also a major threat to this species. Largetooth Sawfish are listed within Appendix I on CITES, preventing the international trade of this species. Urgent conservation actions suggested by the IUCN Species Specialist Group include protection at national level, enforcement of the CITES ban, reduction in bycatch mortality, conservation of mangrove and other coastal tropical/subtropical habitats, and instigating regional recovery plans. Largetooth sawfish are globally distributed across the tropics and occur in four subpopulations: The Eastern Atlantic: from Portugal to Angola, including the western Mediterranean Sea; the Western Atlantic: from Florida and the Gulf of Mexico to Brazil, including the Amazon river up to 7,500 km inshore; the Eastern Pacific from the Gulf of California to Peru; and the Indo-West Pacific: from India and Southeast Asia to Northern Australia. However, local extirpations are thought to have occurred in at least 29 countries in Africa, Latin America and Central Indian Ocean. This is an euryhaline species, meaning it can move through salinity gradients. The largetooth sawfish inhabits inshore coastal waters, estuaries, lagoons, river mouths and even rivers. There is a population in Lake Nicaragua. Mature individuals inhabit shallow marine and brackish coastal systems, while juveniles spend their early years in freshwater habitats. Juveniles are known to feed on molluscs, insects, nematodes and fish, while the adults feed mostly on fish and prawns.